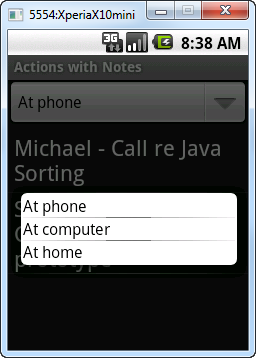 My Actions with Notes Android app is now a working prototype. 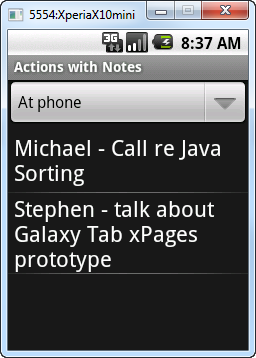 I mentioned it before: Actions for Notes Android app - getting started. It is able to retrieve ToDo items (Actions in Getting Things Done / eProductivity speak) from your Lotus Notes email database. 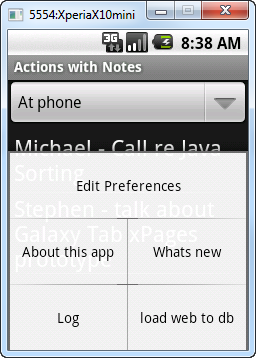 You can browse the Actions by Category. Offline. It is a prototype. There are obvious UI problems. But it works. Actually I think that it already has some real value. I need a handful of testers. I am looking for input on what to fix and implement to move the prototype to a level where it is of real use. If you would like to help me, please get in touch. Use the comment feature below (click Comments) and remember to fill in the email address field (address is only visible to me, not to email harvesters).